I know it's been months since I posted here, but the blog hasn't been forgotten. I've been working on some needed updates to the web site's theme. It's still a work in progress so the blog (and site) may be down occasionally. I'm also going to start updating the too-long-neglected list of women science bloggers. I'll be making the updates gradually over the next month or so, but feel free to drop me a note here if you'd like me to consider including your blog. And if you are a blogger yourself, consider contributing to the March Scientiae Women in Science blog carnival, hosted this month by Amanda at A Lady Scientist. The theme is "continuity". Today it was announced that Elizabeth H. Blackburn, Carol W. Greider and Jack W. Szostak would share the 2009 Nobel Prize in Physiology or Medicine "for the discovery of how chromosomes are protected by telomeres and the enzyme telomerase". The award shouldn't have come as a surprise to anyone familiar with the modern biological sciences, since their work was indeed groundbreaking. It wasn't a matter of "if" they would win, but "when". Telomeres are stretches of repetitive DNA that protect the ends of chromosomes during cell division - Blackburn has compared them to the tips on the ends of shoelaces1 that keep them from unraveling. As cells divide the telomere sequences get shorter and shorter, which limits cells to a fixed number of divisions. Telomere shorting is thought to be responsible for aging on a cellular level. Cancer cells, which divide indefinitely, carry mutations that allow the maintenance of telomere length. You can find out more about the science by exploring the history of telomere research on the Lasker Awards site and by watching Blackburn's 2008 Women@GoogleTalk about telomeres and aging. In 1998 Blackburn and Greider were recipients of the Canada Gairdner International Award. Blackburn, Greider and Szostak received the Albert Lasker Basic Medical Research Award in 2006. 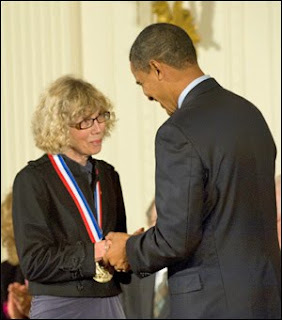 This award is often called the "American Nobel"
Blackburn, Grider and Joseph G. Gall shared the 2007 Louisa Gross Horwitz Prize for "outstanding basic research in the fields of biology or biochemistry." The main influence my parents' careers had on me was that it gave me the idea that women and men were equivalent in careers. They were both physicians, they grew up at the same time, and they trained at the same time. Probably, the other influence it had was showing me that motherhood and career can go together. My mother worked part-time much of the time, as I was one of seven children! After receiving her B.Sc. and M.Sc. degrees from the University of Melbourne, she moved to the UK, where she earned her doctorate from the University of Cambridge in the laboratory of biochemist Frederick Sanger, who pioneered methods of nucleic acid sequencing. 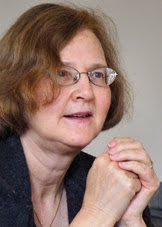 She moved to the United States in 1975 for postdoctoral work in the lab of Joseph G. Gall2 at Yale. It was in Gall's laboratory that Blackburn analyzed the structure of the chromosomes of the fresh water protozoan Tetrahymena, discovering that the DNA sequence ends of chromosomes consisted of simple repeated DNA sequences. As Gall has recalled,3 they didn't fully appreciate the revolutionary nature of the discovery at that time. The work Liz was doing in my lab was technically advanced, because she was using techniques learend in Sanger's lab, and virtually no one else in the world was doing that kind of work. We were interested in sequencing partly because it was something you could do and we knew there were unusual features about these molecules. At the time, we didn't say, Eureka, we found what the ends of chromosomes are like. She had made a discovery whose significance we didn't yet appreciate completely. I knew Liz was extremely good, but I didn't know she as a superstar until she started doing her own independent work. 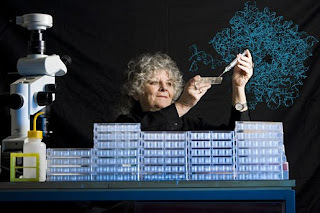 After completing her postdoc, Blackburn joined the faculty of the University of California at Berkeley in 1978, where she continued her study of telomere biochemistry. There she and one of her graduate students, Carol Greider, discovered telomerase, the enzyme that adds telomere DNA sequences to the ends of chromosomes (read more about that below). 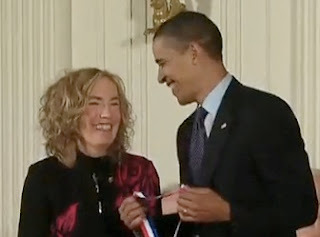 In 1990 Blackburn moved her lab to the University of California at San Francisco, where she continues to study telomere function and biochemistry. Blackburn has also been involved in the political side of science. In 2001 she was appointed by the Bush administration as a scientist member of the President's Council on Bioethics. Blackburn and fellow panelist Janet Rowley were very critical of the scientific content of the Council's reports on stem cell research and aging. 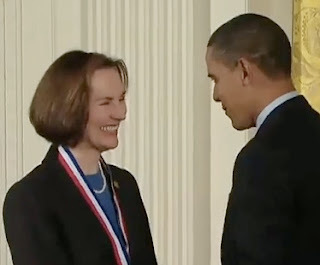 Her removal from the panel in 2004 drew criticism from scientists who believed she was removed because of her advocacy for human embryonic stem cell research and therapeutic cloning. 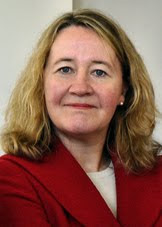 Carol Greider grew up in Davis, California, the daughter of two scientists: her mother was a biologist, who died when Greider was six and her father was a physicist at UC Davis. “I had great research experience, great letters of recommendation, and outstanding grades, but I had poor GREs.” Although she did not know it growing up, Greider suffers from dyslexia, which affected her scores on standardized tests. Only two schools—the California Institute of Technology (Pasadena, CA) and the University of California, Berkeley— offered her an interview. When she met with cell biologist Elizabeth Blackburn in Berkeley, things clicked again. “I really liked my conversations with Liz, and there were a number of other people in the department that would be potentially fun to work with, so I went there,” says Greider. "If you were easily intimidated, you wouldn't take on that kind of project," Blackburn says. "We had to be both rigorous and enterprising, and those are exactly the characteristics that Carol has. the combination is a great strength." For her part, Greider worked 12-hour days and supplemented her existing biochemistry knowledge with DNA cloning techniques and other skills needed for the project. Nine months after she began the project, and after much trial and error finding the right substrate and assay, Greider identified the first signs of her enzyme. On Christmas Day in 1984, she developed one of her gels and saw a ladder of the characteristic Tetrahymena 6-base telomeric repeats - exactly the pattern that would be expected from a telomere-synthesizing enzyme. Of course that was just the beginning. Greider and Blackburn had to rule out the possibility that the results were an artifact. It wasn't until June of 1985 that they were completely convinced that they had isolated the correct enzyme. Greider and Blackburn seem to have had a very good working relationship, which likely contributed to her success. After receiving her PhD, Greider continued research on the biochemistry of telomerase and the biological function of telomeres at Cold Spring Harbor, first as an independent fellow and then as an Investigator. She moved her lab to the Department of Molecular Biology and Genetics at Johns Hopkins University School of Medicine in 1997 where she is continues her research today. 1999 American Society for Cell Biology profile. 2003 Richard Lounsbery Award, presented by the National Academy of Sciences for "extraordinary scientific achievement in biology and medicine"
DNA From the Beginning "Blackburn, Greider and Szostak share Nobel for Telomeres"
1. Aglets, as any regular crossword puzzle worker knows. 2. Joseph Gall was (and is) well known for providing a supportive environment for women scientists in his lab. 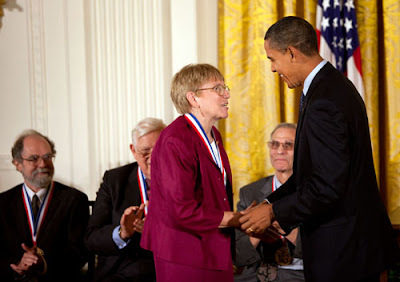 Many successful women scientists have been members of his lab, including Blackburn, Mary-Lou Pardue, Susan Gerbi, Joan Steitz and Virginia Zakian. 3. Quoted in Elizabeth Blackburn and the story of telomeres; deciphering the ends of DNA by Catherine Brady.